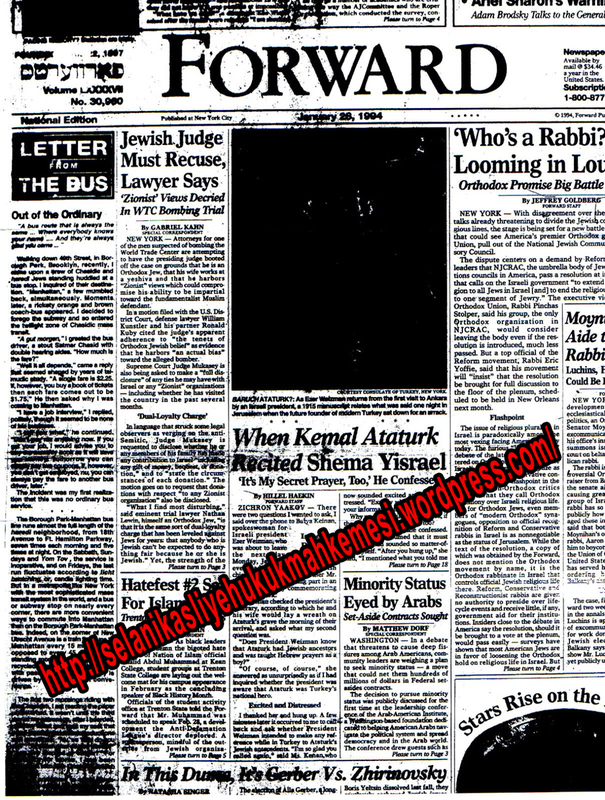 Former Naval Intelligence officer - turned investigative journalist Wayne Madsen has just released an article on Dönmeh - secret Jews of the Middle East. These people are descendants of Spanish Jews who have been expelled by the Spanish monarchs in XV century and relocated to Ottoman Empire and other Middle East countries where many of them sham-converted to Islam and gradually attained great economic and political power. It was they who made the Turkish revolution as Young Turks and smashed the ancient Ottoman Empire. Mustafa Kemal Atatürk - the leader of Young Turks was actually Jewish (which is vigorously denied by Turkish government). Since then the Dönmeh have been the backbone of the political power in Turkey. This explains the exceptional "friendship" between Turkey and Israel. This also helps explain why the FBI whistleblower Sibel Edmonds has been so effectively gagged after 9/11. Her testimony might cast some light on the role of Turkish and Israeli role in 9/11. It was the Dönmeh too who gave rise to Saudi Kingdom and the ruling family there. This explains the close ties between "Saudi" Arabia and Israel and the Saudi support for Israeli drive to war with Iran as well as the Saudi LACK of support for their co-religionists - the Palestinians. Many Dönmeh, along with traditional Jews, became powerful political and business leaders in Salonica. It was this core group of Dönmeh, which organized the secret Young Turks, also known as the Committee of Union and Progress, the secularists who deposed Ottoman Sultan Abdulhamid II in the 1908 revolution, proclaimed the post-Ottoman Republic of Turkey after World War I, and who instituted a campaign that stripped Turkey of much of its Islamic identity after the fall of the Ottomans. Abdulhamid II was vilified by the Young Turks as a tyrant, but his only real crime appears to have been to refuse to meet Zionist leader Theodore Herzl during a visit to Constantinople in 1901 and reject Zionist and Dönmeh offers of money in return for the Zionists to be granted control of Jerusalem. Like other leaders who have crossed the Zionists, Sultan Adulhamid II appears to have sealed his fate with the Dönmeh with this statement to his Ottoman court: “Advise Dr. Herzl not to take any further steps in his project. I cannot give away even a handful of the soil of this land for it is not my own, it belongs to the entire Islamic nation. The Islamic nation fought jihad for the sake of this land and had watered it with their blood. The Jews may keep their money and millions. If the Islamic Caliphate state is one day destroyed then they will be able to take Palestine without a price! But while I am alive, I would rather push a sword into my body than see the land of Palestine cut and given away from the Islamic state.” After his ouster by Ataturk’s Young Turk Dönmeh in 1908, Abdulhamid II was jailed in the Donmeh citadel of Salonica. He died in Constantinople in 1918, three years after Ibn Saud agreed to a Jewish homeland in Palestine and one year after Lord Balfour deeded Palestine away to the Zionists in his letter to Baron Rothschild. One of the Young Turk leaders in Salonica was Mustafa Kemal Ataturk, the founder of the Republic of Turkey. When Greece achieved sovereignty over Salonica in 1913, many Dönmeh, unsuccessful at being re-classified Jewish, moved to Constantinople, later re-named Istanbul. Others moved to Izmir, Bursa, and Ataturk’s newly-proclaimed capital and future seat of Ergenekon power, Ankara. Some texts suggest that the Dönmeh numbered no more than 150,000 and were mainly found in the army, government, and business. However, other experts suggest that the Dönmeh may have represented 1.5 million Turks and were even more powerful than believed by many and extended to every facet of Turkish life. One influential Donmeh, Tevfik Rustu Aras, was a close friend and adviser to Ataturk and served as Turkey’s Foreign Minister from 1925 to 1938. Ataturk, who was reportedly himself a Dönmeh, ordered that Turks abandon their own Muslim-Arabic names. The name of the first Christian emperor of Rome, Constantine, was erased from the largest Turkish city, Constantinople. The city became Istanbul, after the Ataturk government in 1923 objected to the traditional name. There have been many questions about Ataturk’s own name, since “Mustapha Kemal Ataturk” was a pseudonym. Some historians have suggested that Ataturk adopted his name because he was a descendant of none other than Rabbi Zevi, the self-proclaimed Messiah of the Dönmeh! Ataturk also abolished Turkey’s use of the Arabic script and forced the country to adopt the western alphabet. It was Ataturk’s and the Young Turks’ support for Zionism, the creation of a Jewish homeland in Palestine, after World War I and during Nazi rule in Europe that endeared Turkey to Israel and vice versa. An article in The Forward of May 8, 2007, revealed that Dönmeh dominated Turkish leadership “from the president down, as well as key diplomats... and a great part of Turkey’s military, cultural, academic, economic, and professional elites” kept Turkey out of a World War II alliance with Germany, and deprived Hitler of a Turkish route to the Baku oilfields.” In his book, The Donme: Jewish Converts, Muslim Revolutionaries and Secular Turks, Professor Marc David Baer wrote that many advanced to exalted positions in the Sufi religious orders. Israel has always been reluctant to describe the Turkish massacre of the Armenians by the Turks in 1915 as “genocide.” It has always been believed that the reason for Israel’s reticence was not to upset Israel’s close military and diplomatic ties with Turkey. However, more evidence is being uncovered that the Armenian genocide was largely the work of the Dönmeh leadership of the Young Turks. Historians like Ahmed Refik, who served as an intelligence officer in the Ottoman army, averred that it was the aim of the Young Turks to destroy the Armenians, who were mostly Christian. The Young Turks, under Ataturk’s direction, also expelled Greek Christians from Turkish cities and attempted to commit a smaller-scale genocide of the Assyrians, who were also mainly Christian.